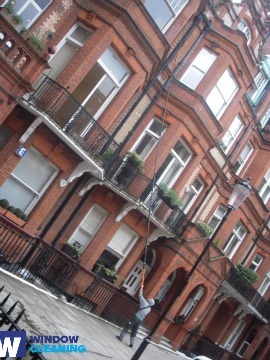 Do you experience difficulties with the process of window cleaning around your property? Your struggles are not enough to wipe stains, water streaks and dirt from glass surfaces? The professionals of window washing in Tulse Hill will give you a hand! Say farewell to the innumerable hours of polishing and wiping – the skilled and experienced team members will handle this matter. You will be able to make the most of your extra time – just let us do this slow and tiresome work for you. Our professional approach will grant you lots of perks. We also provide our professional services in nearby areas: West Norwood, Tottenham Hale, White Hart Lane, Sydenham Hill, Norbury. You can be sure that the good look of your business property is certain. The experts will provide you with top-notch commercial window cleaning. With the help of our water-fed extension pole system, you will receive quick and excellent washing of all windows up to the fourth floor. For high-rise buildings, we proceed with our rope access gears. It is our efficient way of reaching glass panes on taller edifices. It doesn't matter what is the size of your property – a humble corner shop or reinforced-concrete giant of London – we will ensure pristine look of your windows. You can always rely on our workmanship and commitment for domestic and business window cleaning. Our abilities allow us to clean all kinds of windows you could have as part of your property. For instance, you can order cleaning of single or double windows, French doors, sash windows, bay windows and patio doors. In addition, we include conservatories and skylights as part of our process. So to speak, you can enjoy the good look of your windows with our prompt and trustworthy services. We provide top-notch window cleaning by using next-generation equipment. We deliver gleaming and absolutely clean look for your glass surfaces, skylights and conservatories with water-fed cleaning system and jet washing. The poles we use are attached to water supply in our vans, thus eliminating the risk of damage to the exterior of your home or business premise. What's more, we use completely safe rope access techniques to clean glasses on tall buildings. You can benefit from these methods today – call us on 020 3746 3113! Take advantage of our home window cleaning in Tulse Hill – we provide great services for your home on low prices. We use purified water to clean the windows inside and out. We use ground-based water-fed pole system. Contact us now - dial 020 3746 3113 or just fill in our booking form. Our representatives will help you request a window cleaner and answer your questions. You will appreciate the end-results of our residential services, we assure you to that!